Adia Barnes was introduced as Arizona's head women's basketball coach on April 4, 2016. 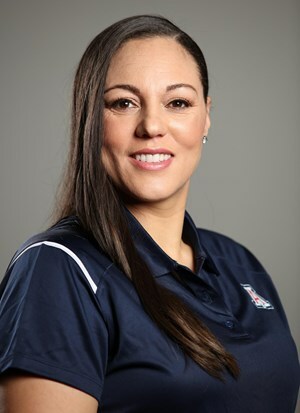 The leading scorer in Arizona women’s basketball history and a WNBA Champion, Barnes came to Tucson after serving as an assistant coach at the University of Washington for five seasons. In her second year as head coach, Barnes signed the highest ranked recruiting class in Arizona history as ProspectsNation.com ranked the class at the fifth-best in the country. Additionally to her success on the court and in recruiting in 2017, Barnes made it a point to get better in the classroom and in the community. The Wildcats had their best academic semester in a decade and also led the athletic department in community service hours. A three-time all-conference selection and '98 graduate of Arizona, Barnes was voted USBWA first-team All-American and Pac-10 player of the year in 1997-98. Her 2,237 career points currently rank ninth on the Pac-12’s all-time scoring list. Following her collegiate career, Barnes played professionally for 12 seasons in the WNBA and overseas. She won a WNBA Championship with the Seattle Storm in 2004, was named to the Storm’s All-Decade Team, and also played for Cleveland, Minnesota and Sacramento. Her overseas career included stops in the Ukraine, Israel, Turkey, Russia and Italy. In addition to her playing and coaching career, Barnes has been extremely active in the community through the Adia Barnes Foundation, which mentors under-served youth and conducts charitable events and community service projects such as school supply drives. Barnes spent 10 years as the Seattle Storm’s TV analyst for NBA TV and FOX Sports Northwest and also spent time as the color commentator for Storm radio broadcasts. A native of San Diego, Calif., Barnes is married to Salvo Coppa, who coached for 14 seasons, including 10 professionally in Italy and with three separate national teams. She is also the mother of one son, Matteo.